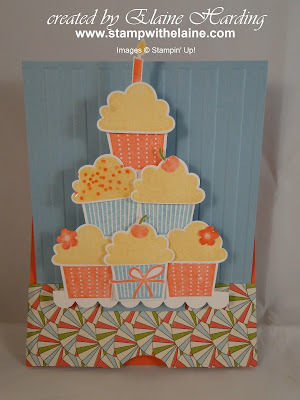 This is a pop-up card using the new Create a Cupcake stamp set in the Spring Mini (page 22) which also has a cup-cake builder punch which co-ordinates with it. I've also used the 2011-13 new In Colors, Pool Party and Calypso Coral which co-ordinates so well with the Everyday Enchantment DSP - free with every £45 purchase for a limited period. Offer ends on 31 March 2012. When you pull the front of the card toward you where the punched crescent shape is, it pops up to reveal this. This was one of the many items I made for the Inspiration Station I did featuring Elementary Elegance at our Quarterly Meeting. 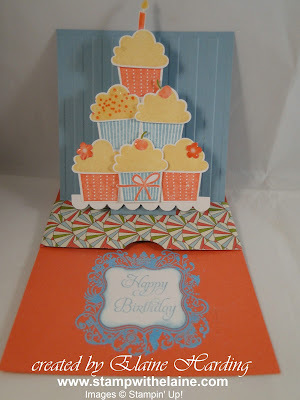 What an adorable card! I'm going to have to try one like this...love it! Thank you - just visited your blog too and your work's awesome!